This Blueberry Cobbler is a quick, easy dessert, perfect for showcasing those summer blueberries! It comes together with just 10 minutes prep and is amazing with a scoop of vanilla ice cream or whipped cream to top it all off! You can easily use other berries or another fruit — strawberries, raspberries, peaches, or apples would all work perfectly and be just as delicious. A fresh, hot fruit dessert is one of my favorite things! The way the blueberries get thick and sweet and syrupy when you bake this blueberry cobbler is crazy good. It’s just begging for a scoop of ice cream! If you’re a blueberry lover like myself, you’re not going to want to miss this Blueberry Buckle recipe or these Blueberry Pie Bars — don’t let those summer berries go to waste! How do you make blueberry pie filling you’re wondering? 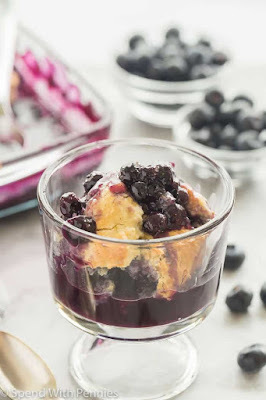 It is much like this blueberry cobbler, but this blueberry cobbler is even easier! Preheat oven to 375 degrees F and lightly grease an 8×8″ baking dish. In a large bowl, stir together blueberries, 1/4 cup flour, and 1 cup sugar. Pour into prepared baking dish. In another large bowl, stir together remaining 1 cup flour, 1/4 cup sugar, baking powder and cinnamon. Add egg, milk and canola oil and stir until completely combined. The batter will be thick. Drop batter over the blueberries by tablespoonfuls, covering as much of the fruit as possible (it won’t cover completely!). Bake for 35-40 minutes or until topping is golden brown and the blueberries are thickened and bubbly.